Pallet rack, cantilever rack, and other types of warehouse rack are required to be permitted by most local governments. Do I need pallet rack permits? It’s a question we get asked a lot. The answer is: Probably. Most cities require permits on any racking over 5′ 9″ tall. Whether you choose to get permits is up to you. We provide permitting assistance to get your pallet rack fully permitted so you can begin using your new pallet racking system as quickly as possible. 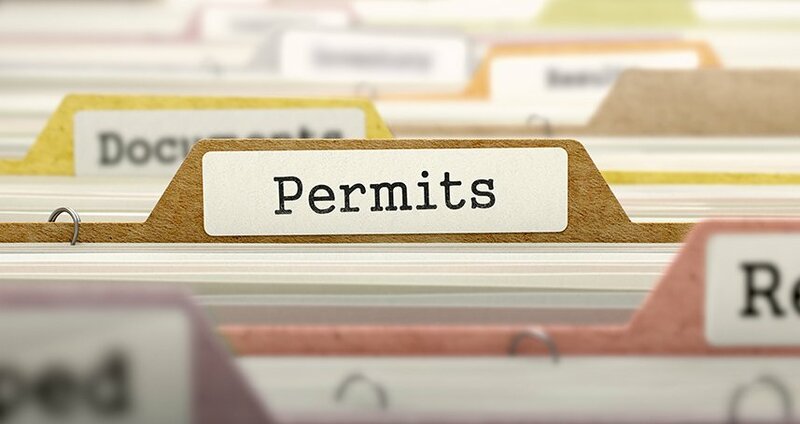 What permits are actually required? There’s two: City (or County) Permits and Fire Permits. Some cities automatically include the Fire Permits in their permitting process. Most cities require permits of industrial storage racks that are over 5’ 9” high. Product stored above 12’ is considered High Pile Storage. (Note: 12’ is the most common cutoff, though the exact height can vary by jurisdiction.) High Pile Storage permits requires more involvement from the Fire Marshal who will assess the flammability of the product being stored, and the adequacy of the fire sprinkler system. Like many city permit fees, the permit fees for warehouse racking systems are typically a percentage of the total value of the racking project. The fee can vary widely, but we commonly see fees in the range of 10-30% of the racking value and installation cost. There are several steps to obtaining permits for warehouse storage racking. While the exact steps can vary by county or state, here is an overview of the typical process. Seismic calculations are a required part of the permit process in nearly every state. Our engineers perform the calculations based on the specific configuration of racking in your warehouse, and the estimated loads you intend to place on the racking. We’ll fill out the necessary documentation to pull an initial permit for the racking. We submit the documentation and work with the local government to process the initial permit. Once the initial permit has been pulled, rack installation can begin. Our professional rack installers will install the racking in accordance with all city/county/state codes. The permitting authority requires an independent testing company to verify the rack was installed and anchored properly. The permitting authority performs their final inspection to verify the installation meets all requirements. After a successful final inspection, the permit is then “finaled” and the racking can be loaded and used. Of all the steps in a warehouse rack project, obtaining permits is one of the least exciting. It’s a lot of paperwork, communicating with multiple parties, and standing in line at the permit office. Let us handle it for you. Contact us today to get a quote on permitting your warehouse racking.